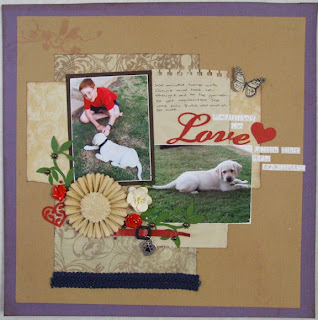 Scrapbooking, cardmaking and family stories. Whilst the boys headed off to watch Perth Glory win the soccer game last night, I got some scrapping time at a local pizza and papercrafting night. Not many scrapbookers go but plenty of card makers so it's interesting to wander around and see the different techniques people are trying. I managed to complete 3 layouts, all challenges over at Home and Scrapped. 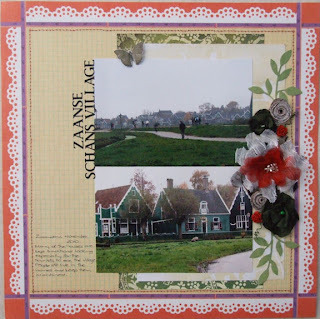 The first was a mid week sketch from Scrappy Sketches, number 10-12 with some more photos from just outside Amsterdam. This is my example for Sarah's challenge to use a magazine front for inspiration. I chose to go with the colour palette, banner and country theme of the cover with a photo of Mitchell at the Yallingup shearing shed on camp. They convinced a group of girls and boys that they had been chosen to learn how to clean up the sheep droppings from the pens and when they came inside to do the job, they let these lambs in that needed to be fed. You should have heard the squeals of delight. This is a Mid-week sketch from Scrappy sketches 8-12 and still lots of photos from my trip appearing. This is a Mid-week sketch from Scrappy sketches 7-12 with some of Heather's lovely flowers from her flower shop. I planned to do at least 10 layouts and I think I achieved them all in the end plus the few cards. I also spent time making some flowers as the lovely Barbara showed us how to make some flowers using a heat tool instead of the time consuming task of using a candle. It's probably a little safer to do it that way too. Then, there was Kim who brought along her Tim Holtz rosettes dies so I got to practice making one or two of those too. This is a double I finally got around to with the photos of the witches in the windows and restaurants around Vielsalm in Belgium. I included the legend of them from the guide book instead of journaling it all myself. 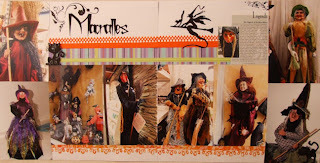 Some more borrowed MS punches and a die-cut witch from the Free SVG Blog and some cats from a Cricut cartridge made a quick and easy page. The title is cut with the Ecraft using "A Charming Font" which I had installed on my PC. I'm a part-time working Mum with triplet boys born in Jan, 2000 and 2 step-sons in their thirties. 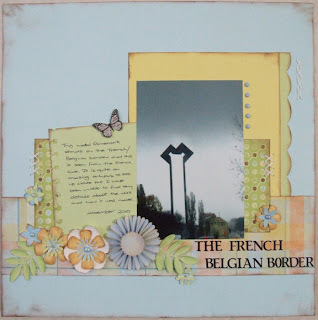 I love scrapbooking and cardmaking and sharing our lives with exchange students.